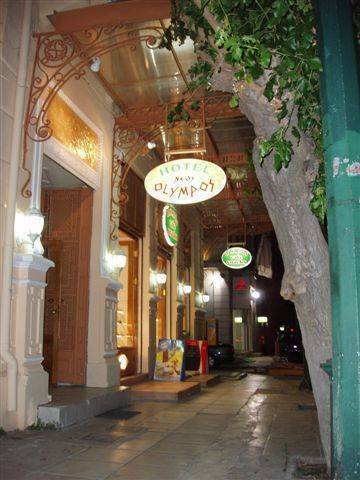 Hotel Neos Olympos is situated in the heart of Athens in front of metro and the Central train station. We offer 30 clean spacious rooms for 1, 2, 3 or 4 persons most of them with balcony, many with private bathrooms and others with shared facilities but ALL with central heating, air condition and tv. The reception is open 24 hours per day, 365 days per year to help you. We are close to Metro, Central railway station, Flea Market, Acropolis(4 metro stops), Plaka , Internet Cafes, Gkeek Taverns, shops, Laundry, Travel agency, Night clubs. The traditional building established in 1938 is recently (2004) fully renovated but keeps its traditional character. Come to feel the friendly remarkable atmosphere! Free fast internet access (adsl)! Free left luggage! For as long as you are around the city or the island. Free hot showers! 24 hours per day. Free Safe! For your valuables. Information! About your next move, how and where to go. We offer rooms for 1, 2, 3 or 4 person with private bathrooms or shared facilities and balcony all with TV, A/C and central heating. Bar, restaurant, cafe-snacks, free fast internet access (adsl). Prices per person per night. Cancellation 72 hours before arrival, free of charge. After this period or for no-shows your credit card will be charged the sum of the 1st day. Come out of the Larissa-Europe station, turn right, walk 100m and there you are. From piraeus catch the metro to Omonia. From Omonia catch the red line metro to Larissa station. From Airport catch the suburban to Larissa train station. From any other arrival point or about any other question, call us to give you directions for the cheapest and more convinient way to the Hotel. Central railway station, suburban, bus , taxi , airport.